I have some brand new quilled designs to show you by one of my very favorite quilling artists - and yours too, I bet - Yulia Brodskaya. These were spotted on the website of Cafe Rouge, a chain of French-inspired restaurants located throughout the UK. Yulia was commissioned to quill her typical, eye-catching designs for the purpose of attracting diners and party-planners to reserve dates for holiday events. It credits Yulia, links to her site, and even includes a few videos showing how quilling is done - how cool is that?! I imagine people are often stopped in their tracks by her work and must wonder what this amazing paper art is called. Happily, Cafe Rouge is doing a great job of spreading the word. Is it too early to wish you a Happy New Year? Nah, especially not when the greeting is from a high-kicking cancan girl! Thank you so much for this post Ann, I am a huge fan of Yulia, and these are such wonderful examples of her great talent. Ann, its a pleasure to watch Yulia's breath taking work. In fact i have the screen design she has made gor Google Chrome. So inspiring every time i open the browser! Thank you for sharing her work! thank you for sharing anne. 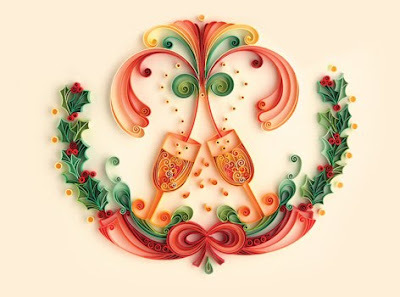 oh, yulia never fails to blast the quilling world! she is SO AMAZING! i love that she's getting such great exposure. her work is mesmerizing. i actually haven't really moved in five minutes staring at that first piece. Wow, these are really amazing! Very inspiring; thank you for sharing! Astonishingly beautiful.I am lost for words. She is an amazing artist. Love her work. That first one is just fabulous although so are the others. I think more companies should follow Cafe Rouge and include an "about the artist" page. Yulia is a fantastic artist. I am always amazed with her beautiful art pieces. Gorgeous!!! I continue to be blown away by Yulia's work - thanks for showing us more! Her quilling is outstanding - but her use of color really pushes it over the top. I'm glad she's getting the exposure she deserves. I love the art deco feel and the colors. Truly wonderful and I'll be sure to check out more of Yulia's work. Thank you, Ann! We all love Yulia! Thanks for posting more of her work. I can't get enough of it. Her Chrome theme is what I use on my home and work browsers! Thanks Ann for showcasing Yulia's latest artpieces...a true artist can work in the negative...that's Yulia!!! Wonder if there is any quiller in the world to match her. Never seen anyone quille like her. Sandy, I'm not sure about the paper she uses, but suspect it's a very lightweight card stock. Anastasia, I agree - there's no one who can match her work, though I've seen a lot of people try. Some come close, but the Yulia-original always shines through.